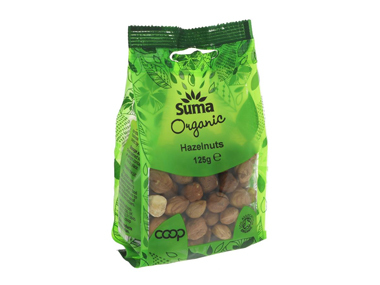 Buy Suma Organic Hazelnuts 125 grams in the UK from our online shop or directly from our independent Scottish store. A healthy pie filled with omega 3 containing seeds, fibre rich avocado and it's gluten free too! Serve it with a side salad as all salad leaves are in season right now! This recipe contains 100g hazelnuts, ground in the kitchen machine. A delicious classic seasonal recipe with a twist. By using tofu of choice instead of real meat, this vegetarian recipe is a treat for everyone. This recipe contains 100g hazelnuts. Because savoy cabbage is in season throughout the winter months, this recipe is also seasonal if eaten in November, December or January. They originally should be shaped into balls, but they are also tasty when flat (as in my attempt!). This recipe contains 50g ground hazelnuts. Who doesn't like a good crumble?! Rhubarb should be in season now, but you can sometimes buy forced rhubarb as early as February/March. Rhubarb is high in oxalic acid, so should be avoided by people suffering from kidney stones. This recipe contains 100g hazelnuts. You’ll have noticed I don’t sweeten it, that’s because I don’t really have a particularly sweet tooth, but if you would like your breakfast a little bit sweeter, opt for low GI sweeteners like honey, brown rice syrup or agave syrup. This recipe contains 5 hazelnuts (or almonds). Delicious vegan chocolate with raspberries, which are in season from June until September. Or you can pick them in the wild! Gluten free cake, vegan cake! This recipe contains 50g hazelnuts. As official Suma stockist, we sell genuine Nuts directly from our shop in Scotland and online throughout the UK. Where can you buy real Hazelnuts 125g - Organic safely online? If you are wondering where you can buy Suma Organic Hazelnuts 125 grams safely online in the UK, then shop with us. We are an actual health foods shop; with real people selling real foods and products. Our award-winning independent shop is located in Stirling, Scotland since 1976. You can buy our Beans, pulses, grains, flours, seeds and dried fruit and other genuine Nuts in store or safely place an order with us online or over the phone. Hazelnuts 125g - Organic - Suma Organic Hazelnuts 125 grams in Nuts and Foods.